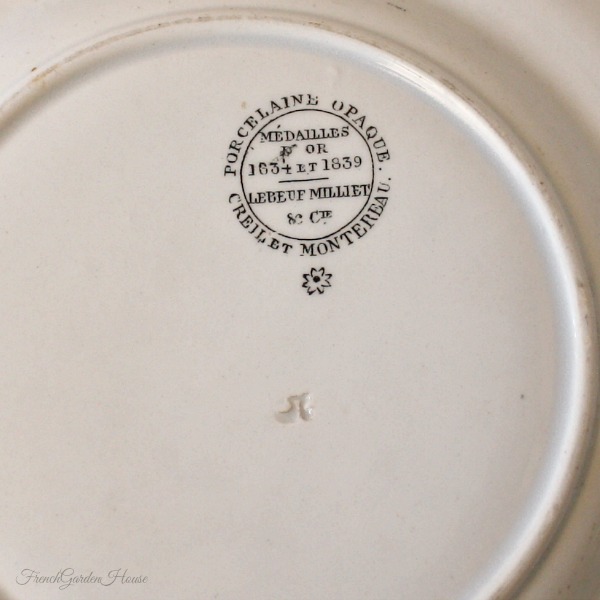 Delightful Antique Creil et Montereau Faience Cabinet or Story Plate Set. 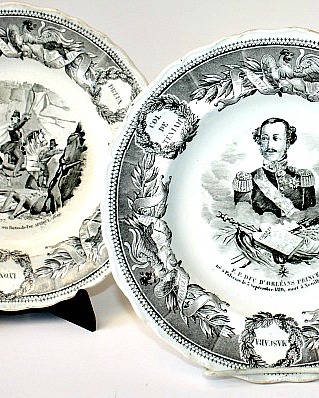 These decorative plates were made between 1840 ~ 1876, by Creil and Montereau Faïenceries under the name Lebeuf, Milliet & Co. Ornate borders with Laurel Wreaths and "Honneur - Patrie", the motto of the Legion d'Honneur of France. 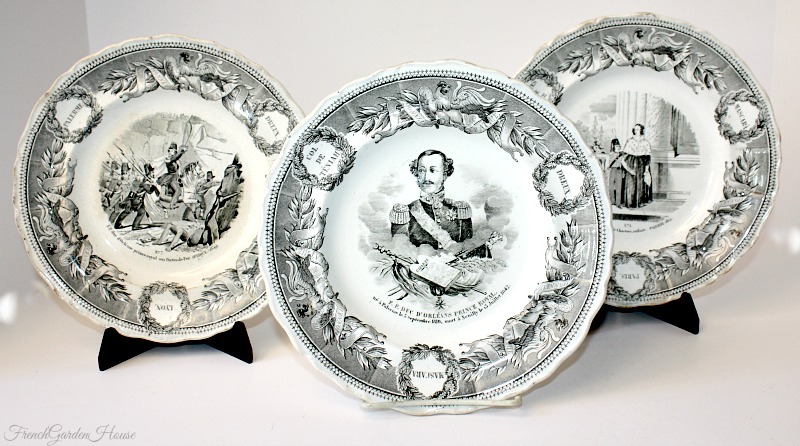 Each plate features a military related scene in the center, the duc as a small boy in his uniform, the Duc Royal as a young man in full military uniform, and the Duc in battle. The subtitles are as follows: "F.P. d'Orleans duc de Chartes enfant Palerme 1814", "F.P. DUC D'ORLEANS PRINCE ROYAL" and "F.P. duc d'Orleans prince royal aux Portes-de-Fer, Afrique 1859." 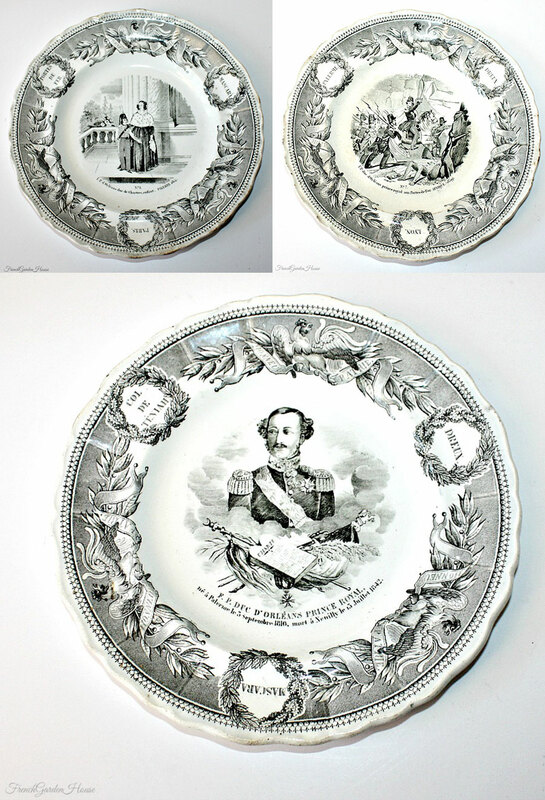 Fantastic to display in a French office, gentleman's dressing room, or to add to your collection of 19th century transferware. Each measures 8~1/8".